Fall is almost upon us and I am so excited! I can’t wait for the weather to get chillier so I can wear layers and accessorize with handmade things like scarves and boot cuffs. 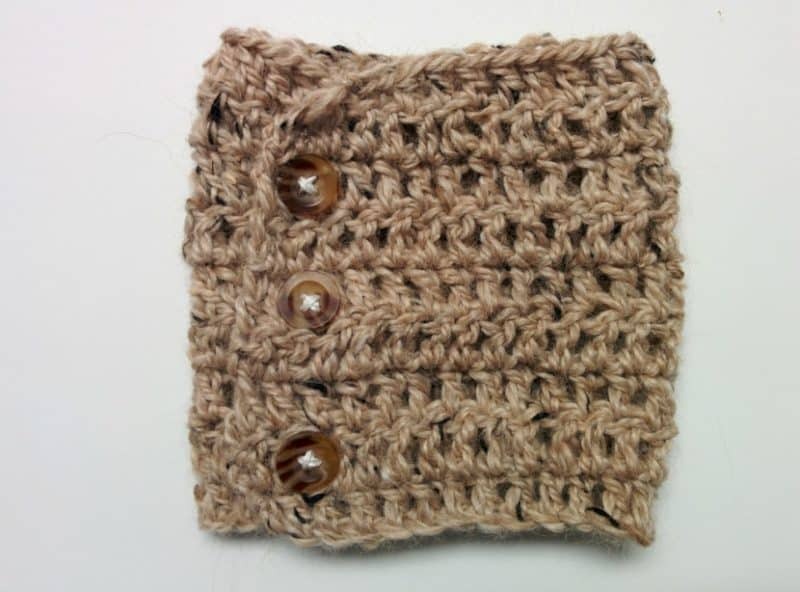 For me, crocheted boot cuffs are the perfect things for Fall; they’re cute and add something special to your outfit. And they’re just right for that in-between weather when it’s chilly but not quite winter. 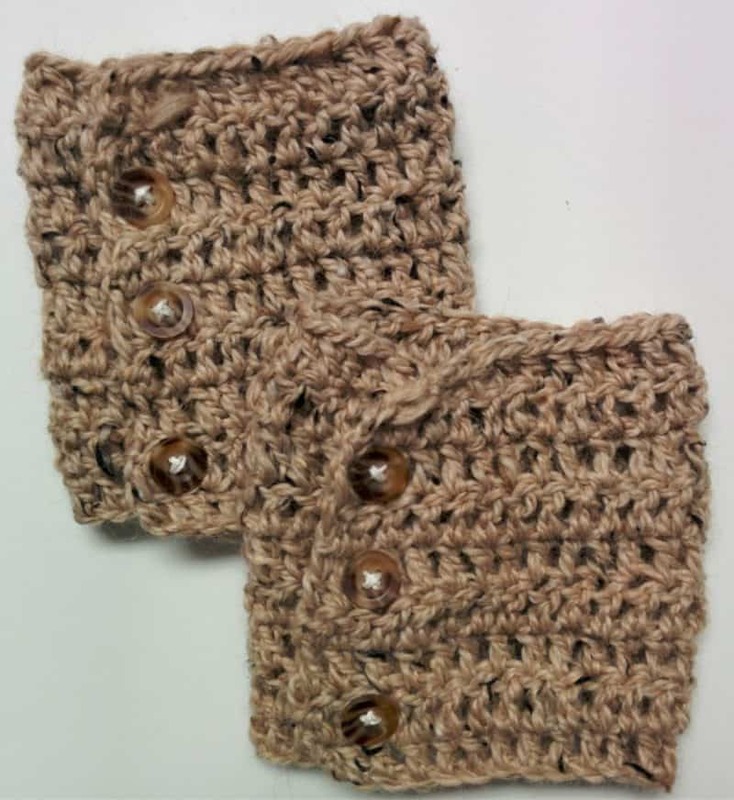 So today, I’m sharing the love of Fall with TWO patterns for crochet boot cuffs. 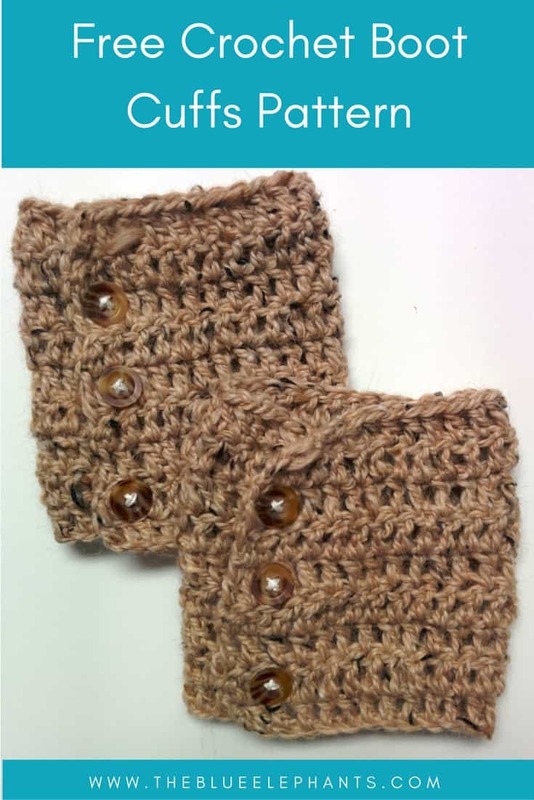 Read on to learn how to make the basic, simple crocheted boot cuffs, as well as a scalloped-edge version! 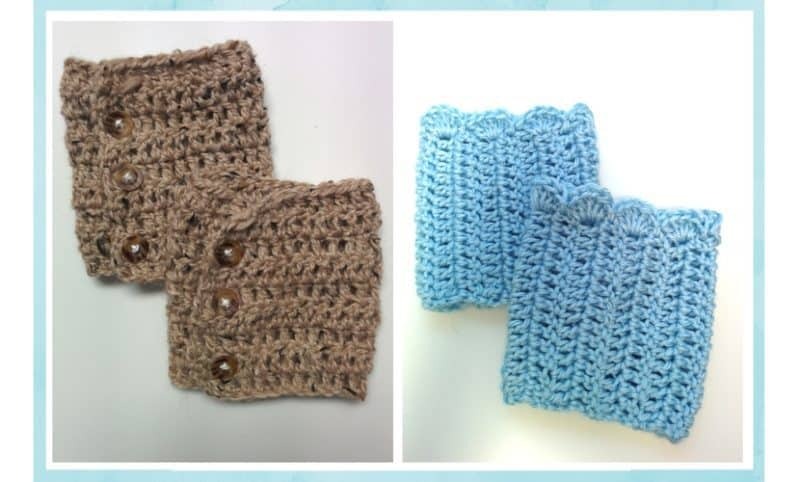 Let’s start by making the simple crochet boot cuffs first. 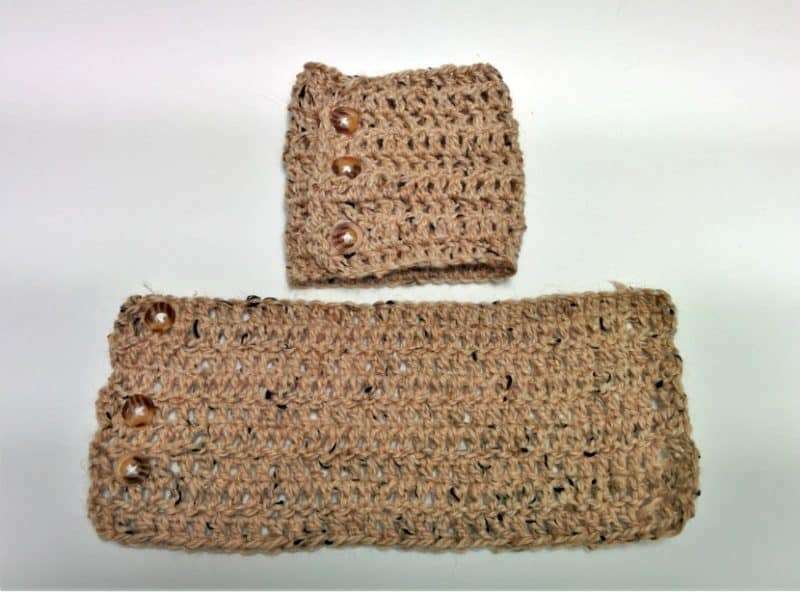 These are crocheted flat using the double crochet stitch (DC), then joined into the cuff shape with buttons. I liked the buttons as a closure method because it made it easy to put on/take off, and there was no need to make buttonholes. The loops of the DC stitch worked perfectly for that! Chain 37. Work a longer or shorter chain depending on your own calf size, but the chain should be long enough to comfortably go around your calf. Then, DC into the third chain from the hook and every space after that. *Chain 2, turn. DC in every space*. Repeat for 10 rows. Fasten off and weave in any loose ends. Using a length of yarn and your tapestry needle, add buttons to one side of the cuff for the closure. It helps to sew the buttons on by working your needle through the stitches you made rather than going around them. This way the buttons are really anchored on and won’t come loose. The spaces between the DC make the buttonholes on the other side, so there’s no need to make them separately. 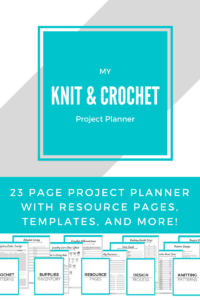 I love this as a perfect beginner’s project; it’s straightforward, easy to do, and it’s finished pretty quickly. If you wanted to make it even easier, you can replace the DC stitches for single crochet (SC) but work more rows so you keep the height. If you liked this pattern but want something with a little bit more detail in it, here is another variation of that pattern. This next one is a little bit more feminine and just a tiny bit more advanced, but don’t worry, it’s not hard. In this next part, you’ll learn how to add a scalloped edge, or shells, along the edge of the cuffs. So, let’s get started! 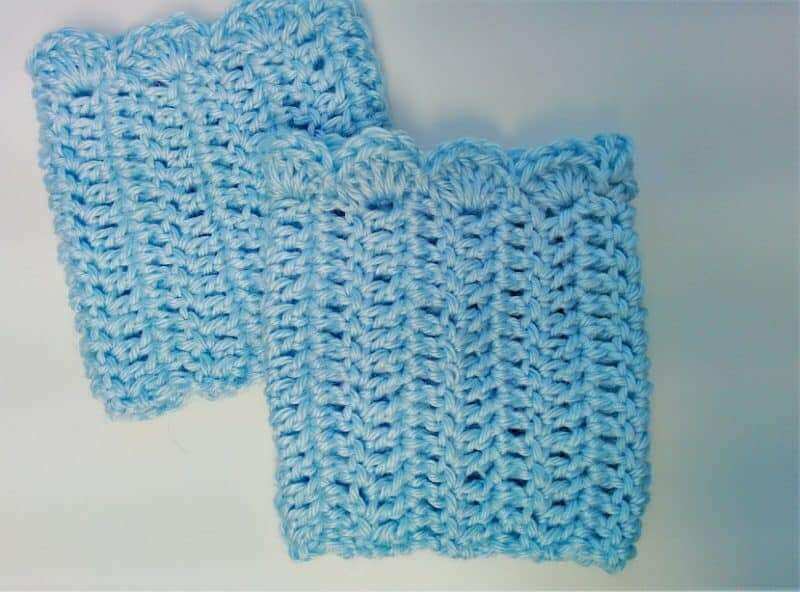 You’ll need the same materials as for the basic boot cuffs, but you don’t need the buttons this time unless you want them. For this pattern, I wanted to use a brighter pop of color and make these cuffs slip-on. These cuffs are worked sideways rather than from the bottom up so that that they have a little more stretch for when you pull them on. Once the body is worked up, the cuff is turned on its side to add the scalloped edge. Using a 5.00 mm hook, chain 17. Turn and DC into the 3rd chain from the hook. DC in every space after that. *Chain 1, turn. DC in every space*. 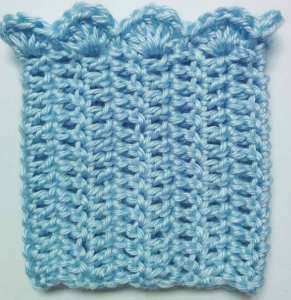 Repeat for 17 rows, or as many rows as you need for the cuff to go around your calf. Now you’ll start working a scallop row across the side of the piece, working into the spaces made by the rows rather than stitch spaces. To do that, rotate the cuff so that your last stitch is at the beginning of the “row” that makes up the long edge of the cuff. *Chain 2, work 5 DC into the next space, skip one space, slip stitch into the next*. Repeat this pattern all along the side to form the shells or scallops. Then, slip stitch to the corner space and fasten off. To finish, you can either sew the side of the cuff closed or add buttons to one side and use the spaces between the stitches as buttonholes like you did for the basic pattern. I chose to sew the sides up this time. I hope you guys enjoyed this post. If you try it out, please let me know what you think of it! I love quick and easy patterns like these, and I have several more beginner patterns all ready for your to try out. You can get more like this in my FREE ebook The Beginner’s Guide to Crochet, and all you have to do to get it is fill out the box below! 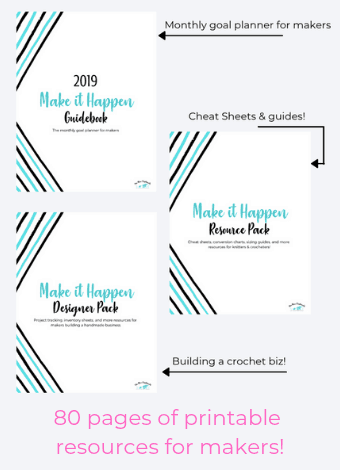 Once you sign up, you’ll get access to the resource library with more patterns and bonus content like the ebook, plus weekly newsletters with the latest from The Blue Elephants. Love the boot cuffs. Perfect for the upcoming season. Love boot cuffs! Thanks so much for sharing with us at Snickerdoodle Create-Bake-Make Link Party! Pinning! I like these for fall and winter, i bet they look great with boots! The colours and little buttons look fab! I love these! Such a quick, easy pattern to follow. Thank you for sharing it! Glad you liked them, Jenny!